When Simon made a website about their straw bale home to share pictures with friends and family, it wasn't long before someone blogged about it and soon the world's media were intrigued by the beautiful house. 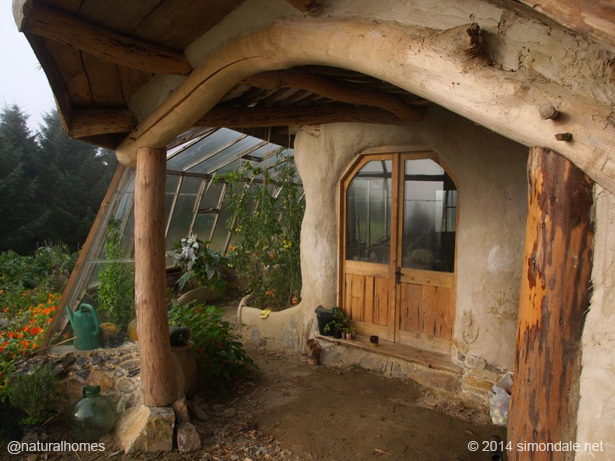 Now Simon and family have moved from their iconic hobbit house to live at Lammas EcoVillage in Pembrokeshire, Wales. Part of the inspiration for Simon's home was his neighbour Tony Wrench (below) who had pioneered the reciprocal roof Simon has used in the design of his home. Simon says, "All around the world people are now, and have been for most of history, building their own homes and they�ve been doing it, not entirely on their own but with help from their community." Simon took 2 months to build his home and added the greenhouse to the exterior the following spring. The home was built with stone, clay and trees all from the land around his home with reclaimed windows and wiring and plumbing. All together the home only cost around $6,000 ($9,000). Jon runs Pun Pun an organic farm, seed-saving operation, and sustainable living and learning centre. 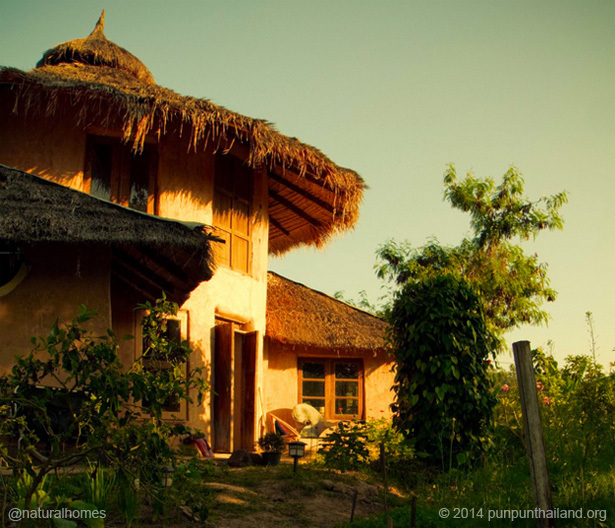 At Pun Pun they use ancient natural building techniques with readily available, local, natural materials with little embodied energy and salvaged materials to make homes, a practical and affordable alternative to resource intensive conventional building. Jon says, "I want to be equal to animals. The bird makes a nest in one or two days; the rat digs a hole in one night, but clever humans like us spend 30 years to have a house... that's wrong." and, "Before I thought that stupid people like me � cannot have a house� because people who are cleverer than me and get a job need to work for 30 years to have a house. But for me, who cannot finish university, how can I have a house. It's hopeless for people who have low education like me. But when I start to do earthen buildings, it's so easy! I spent two hours per day� and in 3 months I have a house. A friend who was the most clever in the class he has a house too but he has to be in debt for 30 years, so compared to him I have 29 years and 10 months of free time. I feel life is so easy." SunRay Kelley has created a magical place where he practices what he calls evolutionary architecture where you make plans, but if a better idea comes along you change your plans. 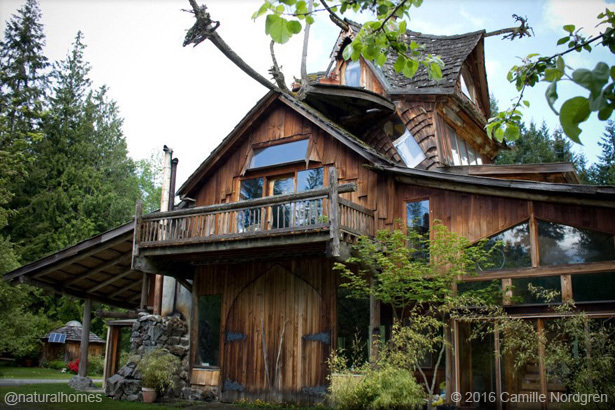 The natural buildings on SunRay's homestead have names like Sky House and The Yogurt, a cross between a yoga studio and a yurt. You can take a tour of the homestead with SunRay in the video above and watch more inspirational natural building videos from the collection right. "The natural world is to me known as the magic kingdom... It's a magical place. There's a lot of magic going on in this world that most people don't even know is happening. That's certainly where all my inspiration comes from." "All building was natural building a hundred years ago. So it's not that far back. In order to go forward we have to go backward... We want to return to a cooperation with nature"
Tony Wrench built his cordwood roundhouse in the winter of 1997/8 tucked away in the Welsh countryside you can literally walk within a few meters of it and not see it. Tony couldn't get planning permission for the home and by 2004 he was on the verge of demolishing it when the public overwhelmingly stood side by side to support his planning application. Tony managed to keep the home until he was able to re-apply under Pembrokeshire's new Low Impact Policy. He says, "The nice thing about houses like this is the actual building materials come from nature and go back to nature so you can build something like this hardly making a mark on the landscape." By 2008 Tony had permission to keep his home and now it is the flagship home for the Welsh government's guidelines for development of settlements in the open countryside called 'One Planet Developments' where Tony's home appears on the cover of the Technical Advice Note 6 (PDF 6Mb), otherwise known as TAN6. 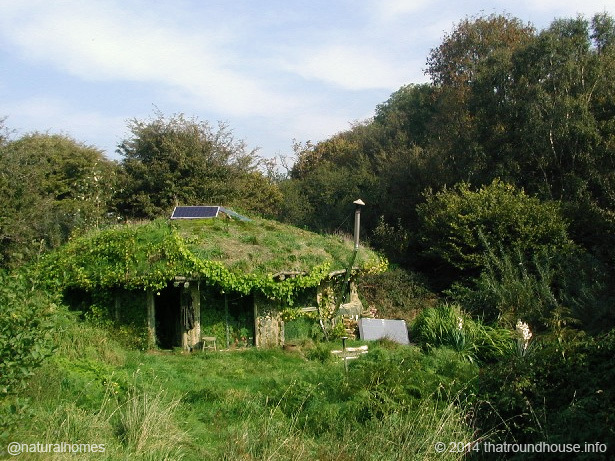 People like Tony and his supporters have helped to make other low-impact settlements possible like Lammas ecoVillage where among others Simon Dale now lives, not a stones throw from another famous roundhouse. 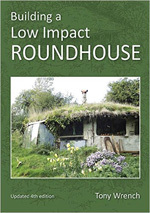 Tony shares his roundhouse building experience in his book (right) 'Building a Low Impact Roundhouse'.